Fig. Optical fluid pump by using laser. 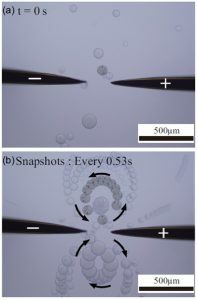 The droplets were segregated from homogeneous solution by the laser irradiation, and emerged droplets generated unidirectional motion caused by the asymmetry of geometry. (Left) Schematic illustration of the experimental setup. 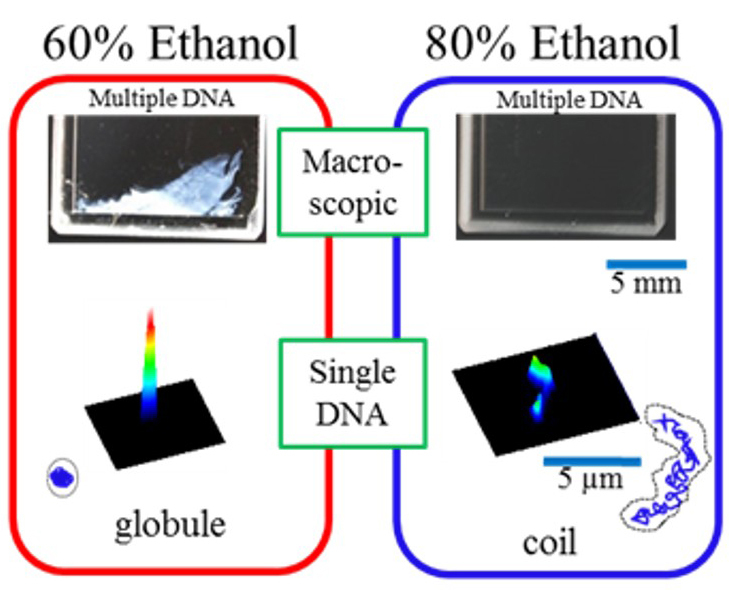 (Center) The flow profile from experimental result. (Right) The flow profile from numerical simulation. Fig. 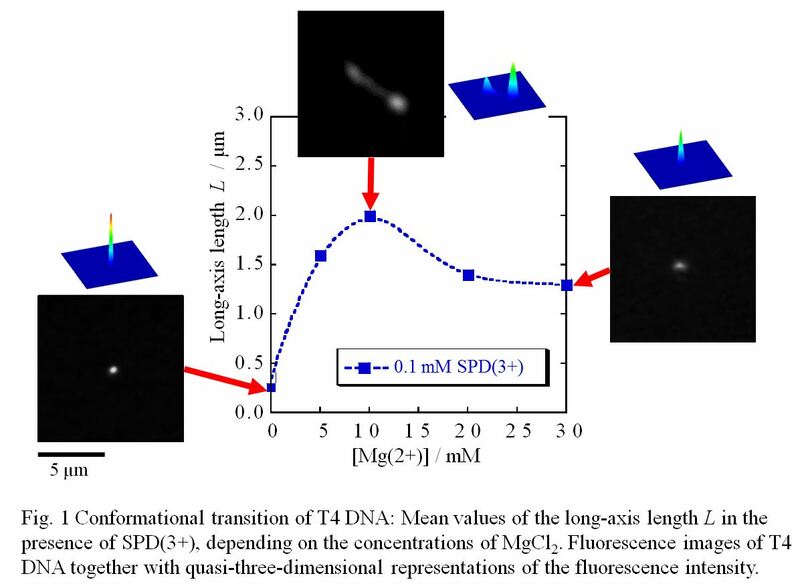 Specific localization of actin and DNA. 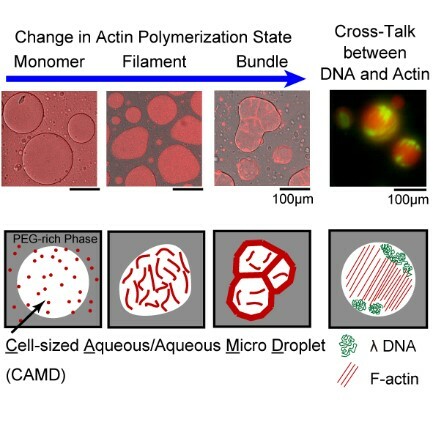 Actin and DNA exhibited specific localization in Cell-sized Aqueous/aqueous Micro Droplets (CAMD) that were spontaneously formed through water/water micro phase-segregation under crowding conditions with coexisting polymers. 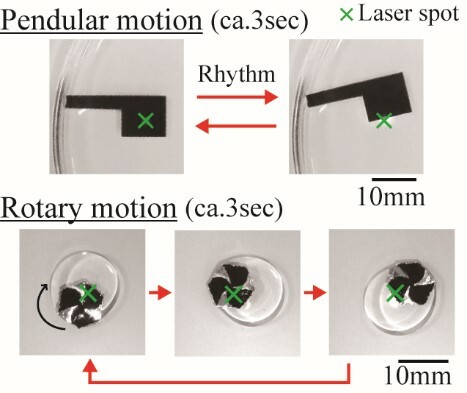 Fig.1: Motion control of the Al sheet by CW laser. Top: pendular motion. Bottom: Rotary motion. The focal point of the laser is marked by the ‘X’. 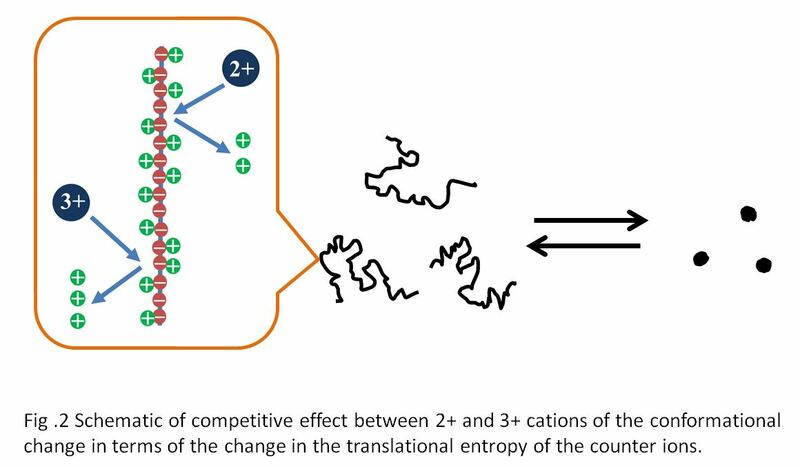 Fig.1: Schematic representations of the experimental system with bird view in (a) and side view in (b); typical snapshots at 0 and 540 seconds (left panel) and the real-time trajectories of the large sphere (right panel) for two distinct packing fractions η = 0.1(NL = 1 and NS = 29) in (c) and 0.6(NL = 1 and NS = 229) in (d), where dL =10mm, dS =3mm and D = 60mm. The scale bar is10mm. Note that the dotted circles in the trajectory plots indicate the outermost boundary which can be reached by the center of mass of a large sphere within the cylindrical disk. FIG. 1. 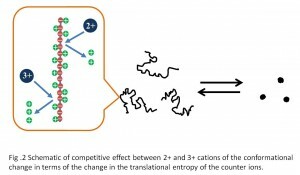 Self-revolution of plastic particles. (a) Initial condition at t = 0 s from when DC voltage was applied. 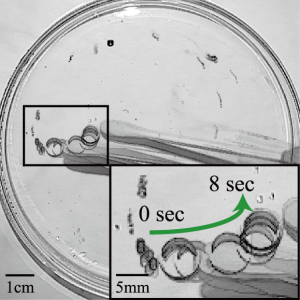 (b) Overlap of snapshots every 0.53 s. Multiple polyethylene particles with radii of r = 50 – 175µm rotate in the oil phase with an anionic surfactant at V = 170 V. FIG. 2. 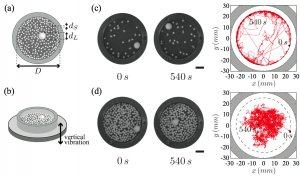 (a-1, b): Angular velocity and angular acceleration depending on the angular position of the particle in the presence of an anionic surfactant (a-1), or a cationic surfactant (b). (a-2): The blue solid line is the velocity and the red dotted line is the acceleration. 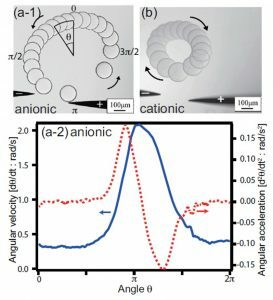 Videos of these experiments are shown in the Supplemental Materials.14 The radius of rotation in both the anionic and cationic surfactants depends on the initial position of a particle. 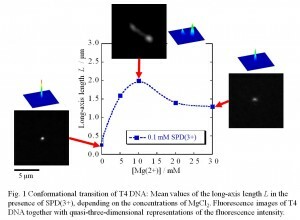 Particle size: d=175 µm. Applied voltage: V =170 V and 180 V for (a) and (b), respectively. Fig.1. Optical construction of a pyramidal assembly. The focal point of the laser is marked by the red ‘x’.